I went into a Giant bike shop in Beijing earlier this week with one intention: to get their bicycle repair man to change the inner-tube on my ancient mountain bike. 60 minutes later, I had also bought the latest and lightest touring bike in the shop. I just couldn't help myself. As I would later explain to my wife, it was an entirely involuntary act. There was nothing I could have done to alter the course of my actions. I saw it... I wanted it... I rode it... I wanted to keep on riding it (even more so after it had been fitted with a Brooks, the saddle of my dreams)... I just had to have it. In other words, there I was minding my own business when, out of the blue, I'm hit with a chemical overload in my brain that fixes the thought, "Got to have it!". That's right, I was just following orders. This phenomenon is not new of course. People have being buying things they didn't set out to buy since they stopped bartering the things they hadn't set out to barter. And marketers have been trying for centuries to make it even harder for someone to go into a shop and only spend a few pennies on a handkerchief, five cents on a soda, or 30 yuan on an inner tube, or whatever. An early example of a brand that made it really hard for people to resist the things they hadn't realised they wanted until seeing them was created by Emile Zola in his book Au bonheur des dames (The Ladies' Paradise). Zola was not only one of the world's greatest authors, he was also a tremendously-insightful ethnographer, not to mention retail-marketing prophet. In The Ladies' Paradise, he wrote about a fictional department store in nineteenth century Paris whose boss, Octave Mouret, had designed the store's layout in a way that ensured, "...temptations present themselves on their [ie the shoppers'] passage". As well as buying a new Giant bike and Brooks' saddle, I also bought a pannier, a set of tools, a pair of cycling gloves and glasses, a Cats-Eye trip-computer, and new toe clips and straps (all of which I'd seen while walking around the shop in the time that my inner-tube was being replaced). Eager to ride my bike, I set out for Pinggu, in easternmost Beijing, more than 30 miles (50km) from "downtown". I'd never been there before, and had no idea what to expect. My only concern was that I needed to arrive in Pinggu central in under 2 hours, thus achieving an average speed of 15mph (or 25kph if you prefer). The myriad of traffic lights didn't help. So I pushed hard. It was thirsty, energy-sapping work. So much so that, at around the 20 mile mark, the thought of noodles crossed my mind. I took this to be a sign that my body was leaking stuff that noodles are made of, and was sending out an SOS in the form of a random thought. Then I had a feeling that I needed to drink a bottle of Minute Maid orange (my drink of choice after a hard slog on the bike). On entering Pinggu (in excess of the average speed I'd sought to achieve I hasten to add), I quickly found a bumper bottle (1.25 litre) of Minute Maid and finished it in a couple of gulps – much to the amusement of the onlooking gaggle of white-hatted chefs sitting outside of a nearby restaurant, taking a break from their cooking duties. Back on my bike, and propelled by bodily need, the search for noodles was on in earnest. Until, that is, I spotted the KFC sign. The thoughts of noodles evaporated instantly. My only thought was to find a place to park my bike so I could see it from the position I would order my chicken sandwich (spicy of course). I wolfed this down while sitting on the step outside the front door of the restaurant (next to my new Giant), and gave thanks to KFC, whose distant signage proved simply irresistible (and whose menu had persuaded me to add an order of super-sweet sweetcorn). Another fine example, no less, of Zola's "[ensuring that] temptations present themselves on their passage" retail strategy. I'm far from being the only person in China for whom the KFC sign has acted like a magnet. The majority of Chinese people who have experienced non-Chinese food would have first done so at KFC. KFC has been the leading crusader in China of something that's taken for granted in many parts of the world... the sandwich. Not just any old sandwich, but a chicken sandwich no less; which of course brings together the best of both worlds. That's right, as KFC spotted 25 years ago when they opened their first restaurant in China, Chinese people love to eat chicken. Today, they are eating more of it than ever before. KFC are helping to make this traditionally important staple meat increasingly more popular, which in turn has helped drive their expansion in China to about 400 new restaurants per year in the past two years. This further increases the chances of a new store enjoying a "fast start", because the positive word-of-mouth extends increasingly far and wide. The arrival of a KFC in any given community is also seen as a "sign" that things are on the up locally, which consequently endears more people to the brand. "He [Mouret, the boss] laid down as a law that not a corner of The Ladies' Paradise ought to remain deserted, requiring everywhere a noise, a crowd, evidence of life; for life, said he, attracts life, increases and multiplies". And, just in case le sandwich is a culinary step too far for some, KFC is now providing more-familar fare in the form of my originally-sought-after noodles, as I would discover on their website soon after my visit (see the screen-grab below). This virtuous circle (of positive word-of-mouth, experience, and yet more positive word-of-mouth) has driven KFC's development in China to the extent that, on Wednesday, Yum! (which owns and runs KFC) announced the opening of the 4,000th KFC in China, in Dalian, Liaoning province. Last month the company announced that it had opened its 300th store in Beijing. It is also significant that the China Daily (the most-read English-language government-approved media organ) is also celebrating the landmark. 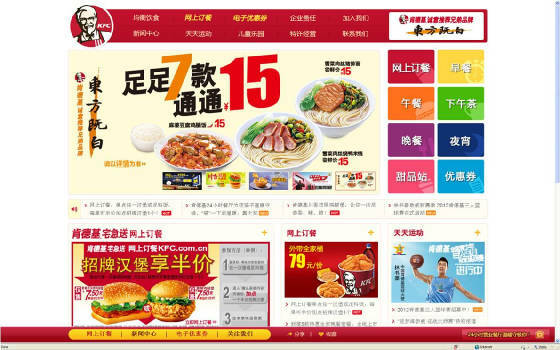 In today's issue, it reports that, "KFC Corp, the largest foreign fast-food chain in China, said it will accelerate its expansion in smaller cities despite the global economic slowdown". The report cites Mark Chu, president and COO of Yum Brands' China division, who says that, "KFC will open more than 500 restaurants each year in the future, compared with 400 annually over the past two years". This is good news for the Chinese consumer, for Yum!, and for people like me who just can't (and don't want to) resist brand-temptations that present themselves at every turn.